Until last week, visiting museums in this country has been a mostly unsatisfying experience. Luckily, we stumbled upon the last day of a week-long exhibit at the Jehangir Gallery entitled “Revisualising India.” Included in the show were pieces from the Osian’s Archive & Library of Cinema and Popular Arts, an auction house and archive center in New Delhi. On display were hundreds of vintage, painted Bollywood posters, photographs from film sets from the 1920s, Ravi Varma lithographs, political posters depicting Gandhi, Nehru, and other folk heroes, art deco style travel posters of Indian destinations, and – for some reason – several Communist-era film posters from Poland and expressive marionettes from Indonesia. Though the show could have used some editing – the colors and clutter overwhelmed – it was entertaining. It was also well-attended – and not just by the few artsy types that show up now and again in Page 3 reviews. Parents brought their children and teenage and college-age groups were there. It was the type of show that didn’t allow you to linger too long over any set of paintings, unless you could resist the pull of the crowds. 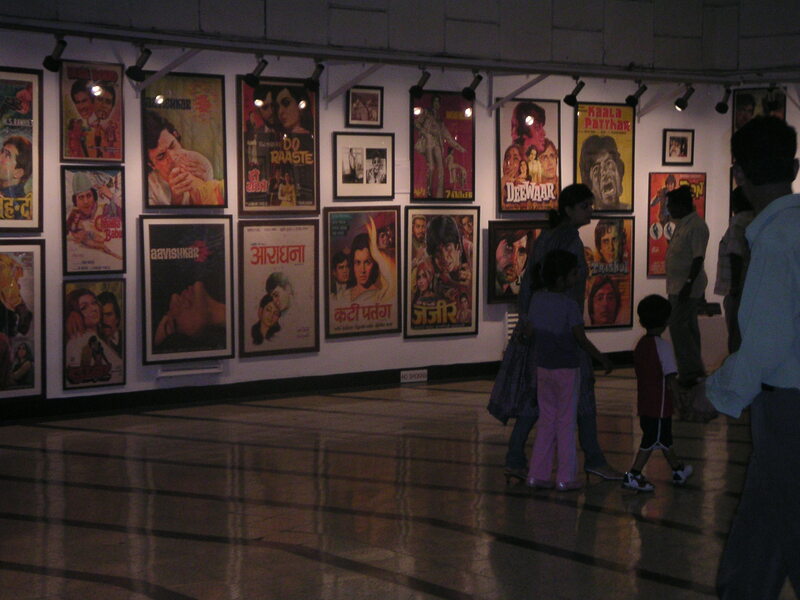 And, it was obvious to me that Bombay, the birthplace of Indian cinema and older sibling to Tollywood (South India’s Tamil cinema) and Lollywood (Lahore, Pakistan’s film capital), craved the kind of show (or even a permanent exhibit) that displayed the great cultural heritage of subcontinental film. In fact, in the hour it took me to walk through the exhibit, I probably learned more than I have in almost one year. So, it strikes me as strange how a land known for its creativity, art, colors, and film could be so lacking in the category of well-curated and well-maintained galleries. Equally befuddling is the absence of a film museum in Bombay. I suppose the city’s giant, single-screen, art deco film palaces are, in effect, the sites of permanent film exhibits. But, as Time Out Mumbai profiled a week or so ago, even those are on the endangered species list. Bombay’s Jehangir Gallery is an exhibit space that is free to all patrons. And, yes, it does allow lesser-known artists to display their works there. But it has only one A/C room. 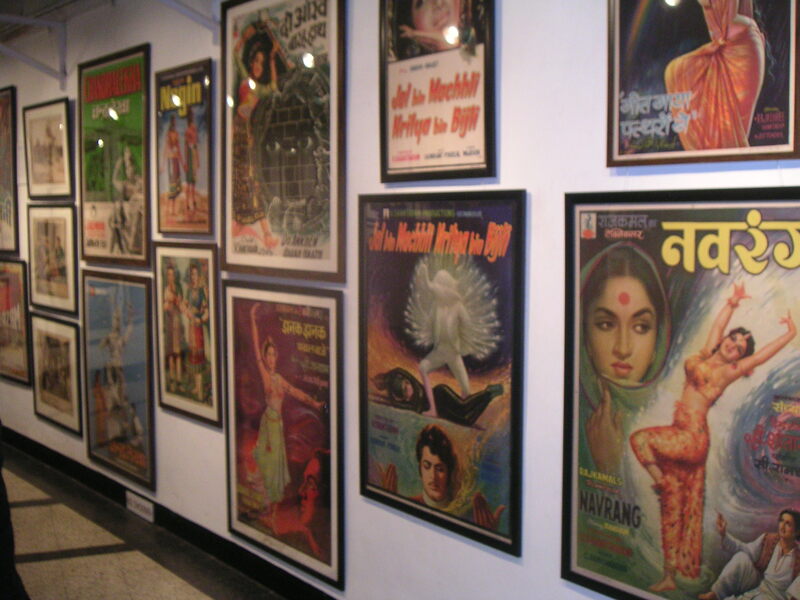 So, half of the vintage posters that were on view, including the old banners for the epic Mughal-e-Azam, were languishing in a warm, humid room. Sure, keeping the A/C going is expensive, but so is losing a big chunk of cinematic heritage. Can’t India’s large corporations kick in some cash for such things? The apathy drives me crazy. By the way, I must also apologize, as I may have contributed to the deterioration of some of Osian’s archive. I snapped the two pictures on this page before I realized that doing so was a faux pas. But, again, there was no A/C! How was I to know that the museum directors even cared about a photo or two? Nevertheless, I quit taking pictures after being reprimanded. Sorry ’bout that. wow.. i wish we would have known about this show!! my boyfriend works in the film industry here. but your blog inspired us to look online for bollywood posters – which we’ve wanted for a while. and we found a good website from delhi that has some authentic stuff auctioned off – all proceeds going to charity. its more expensive probably than finding it on the street somewhere, but we know its real and its for a good cause.. now just waiting to see if we won our bid! (but we actually settled on an old 50’s ad poster rather than film).